The way your body looks on the outside reflects what’s happening on the inside and how you treat it, particularly the quality of your diet. So you should be aware of the nutritional value of the food you consume and if needed, make simple changes to what you eat so that your meals become healthier. Eating poor quality foods, such as refined starches, sweets and processed foods, no matter how small the calorie content causes a hormonal imbalance in our bodies, which slows down our metabolism, causing us to store food as fat and to progressively gain weight, whilst eating high quality foods, such as nutrient-dense proteins, non-starchy vegetables, whole food fats and low-sugar fruits balance our hormones, stimulates our metabolism, causing us to shed any excess weight. Simply, it is the quality rather than the quantity of the food we consume that matters. eliminate all toxic and poor quality food, such as refined starches, sweets and processed foods, which zap your energy, mar the health and appearance of your skin and cause a hormonal imbalance in your body. replace toxic and poor quality food with high quality foods, such as nutrient-dense proteins, non-starchy vegetables, whole food fats and low-sugar fruits that are rich in intelligent nutrients that fortify your body’s cellular health, balance your hormones, stimulate your metabolism, causing your body to burn excess fat and helping you to maintain a healthy weight and body proportions. take three to five complete break days from alcohol each week. drink plenty of water throughout the day – about eight to twelve glasses, to hydrate your skin, carry nutrients to your cells and flush out toxins from your vital organs. Hydration supports your energy levels, raises your metabolic rate, helps you to burn body fat effectively, gives your skin a fresh, radiant glow and is essential for the overall health of your body. add a range of healing and anti-ageing new food to your repertoire. The healthiest, anti-ageing foods available to us have phytochemicals in them. Phytochemicals mean chemicals derived from the energy of light. They contain intelligent nutrients that are both healing and anti-ageing. Foods that are rich in phytochemicals are highly coloured and very important for our overall health and for maintaining the health and vitality of our cells and body. Think of the seven colours of the rainbow – red, orange, yellow, green, blue, indigo and violet, when choosing foods that have phytochemicals. 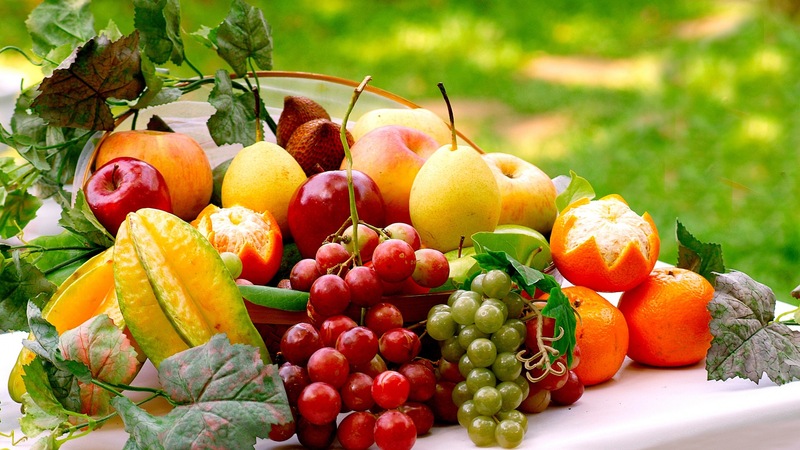 Flavonoids found in apples, cherries, berries, grapes, citrus fruits, broccoli, onions and tomatoes. These range of foods are antioxidants. Antioxidants protect our cells against oxidative damage and reduce the risk of developing many types of cancers and protect us from heart disease. Lycopene found in tomatoes, red grape fruit, pink grape fruit, red oranges, guava and watermelon. These foods are anti-carcinogenic. They inhibit the development of cancer. Phenolic compounds found in cherries, strawberries, pomegranates, nuts, green tea, chilli peppers, oregano, sage and rosemary. These range of foods contain antioxidants and are anti-inflammatory and anti-carcinogenic. Isoflavones found in soya beans, chickpeas, Kudzu and red clover. Isoflavones lower cholesterol and block hormonally stimulated cancer. Sulphides found in garlic, onions and chives. These inhibit blood clotting and are anti-carcinogenic. Isothiocyanates found in broccoli, cauliflower, kale, turnips, brussels sprouts, cabbage and watercress. These cruciferous vegetables inhibit tumour growth. Terpenoids found in peppers, horseradish, turmeric, cinnamon and rosemary. These contain antioxidants and antibacterial properties and help prevent stomach cancers. Incorporate as many phytochemicals as possible into your diet. Improving the quality of your diet will give you more energy, an improved sense of wellbeing and body proportions, almost immediately.